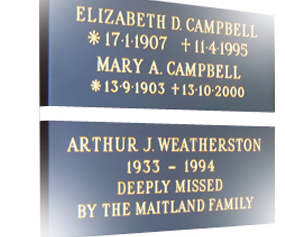 The stone panels are situated in the Book of Remembrance Room and there are two types of panel available – Welsh Blue/Black and Westmoreland Green.There are also two sizes of panel available – single and double. You may place flowers at the base of the wall but we request that you do not attach anything to the panel itself as it may damage it. The lease of the panel is for 10 or 25 years and you can renew it at the end of the period. A single panel will take up to three lines of inscription whilst a double panel will take up to five lines. On a double panel it is possible to leave space for an inscription to be added in the future.